Despite already being Earls or Dukes, the Queen has seen fit to Knight her sons Edward and Andrew. Whilst some people have to give a lifetime of service for a mere BEM (at best), if your Mum's the Queen you can sit on your well-fed arse and just watch the honours accumulate. Edward and Andrew can now use the letters KCVO after their names. HRH The Duke of York KCVO ADC. ADC indicates he is a personal aide-de-camp (assistant) to his mother. He is also Earl of Inverness and Baron Killyleagh. HRH The Earl of Wessex KCVO. He is also Viscount Severn. 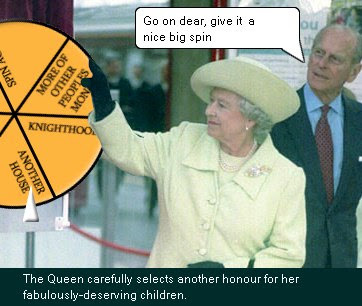 Just to prove the Queen isn't out of touch she bestows more unearned honours on her useless family at our expense. "These are simply family honours which have been handed out for several generations. There are always a few family honours - and these knighthoods are considered rather harmless. Nobody objects to them, because nobody really knows what they are." "It shows that mother loves them, that's all." Many British people do object to the honours system being turned into a farce both by the award of honours in return for party political favours, and being used as a self indulgent back-slapping exercise for members of the Royal Family. Edward failed in the military. He failed at business. The public despise him. And nows he's been Knighted as a reward for his only achievement in life... continuing to breathe. BBC News - Why did Prince Andrew and Prince Edward get knighthoods?